Top travel guide Wanderlust placed Up Helly Aa – which is centred in Lerwick – third on its list of Europe’s “most extraordinary” winter festivals. “Held on the last Tuesday in January in the tiny town of Lerwick in Scotland’s far flung Shetland Islands, Up Helly Aa is Europe’s largest and most spectacular fire festival. It’s a celebration of the islands’ proud Viking heritage, with islanders dressing up in traditional costumes, playing traditional music and partaking of a traditional drink or two,” said Wanderlust. About 70 warriors known as the Jarl Squad, and led by the Guizer Jarl, parade through Lerwick on the last Tuesday in January – followed in the evening procession by 1000 men in colourful costumes. 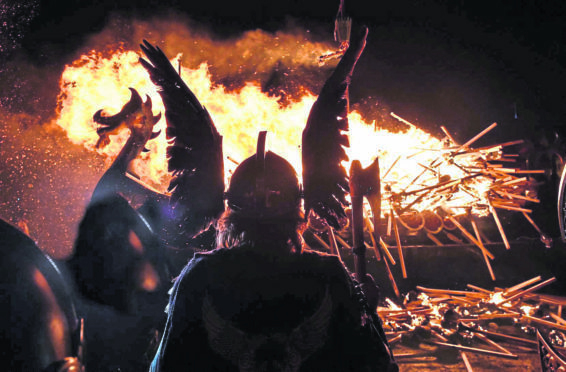 The day culminates in the burning of a replica Viking galley. Then squads embark on 11 hours of visiting various halls. Top of Wanderlust’s winter festivals’ list was Venice Carnival with Ljubljana Dragon Carnival, Slovenia, second.